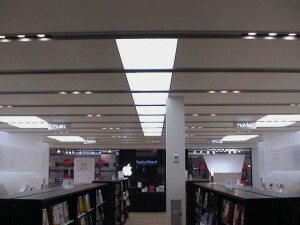 INEX Architectural Products, LLC added 2 new photos to the album: NewMat Ceilings in Apple Store – Perimeter Mall— with Apple Perimeter (4400 Ashford Dunwoody Road, Atlanta) at Perimeter Mall. We were passing by one of our client’s Apple store at a Mall in Atl. These are our Newmat stretch ceilings from France that are backlit and acoustical! They look as good now as 8 or so years ago when they were installed. You dream it, we make it happen!